296 Beacon is located on the north side of Beacon, between Exeter and Fairfield, with 294 Beacon to the east and 298 Beacon to the west. 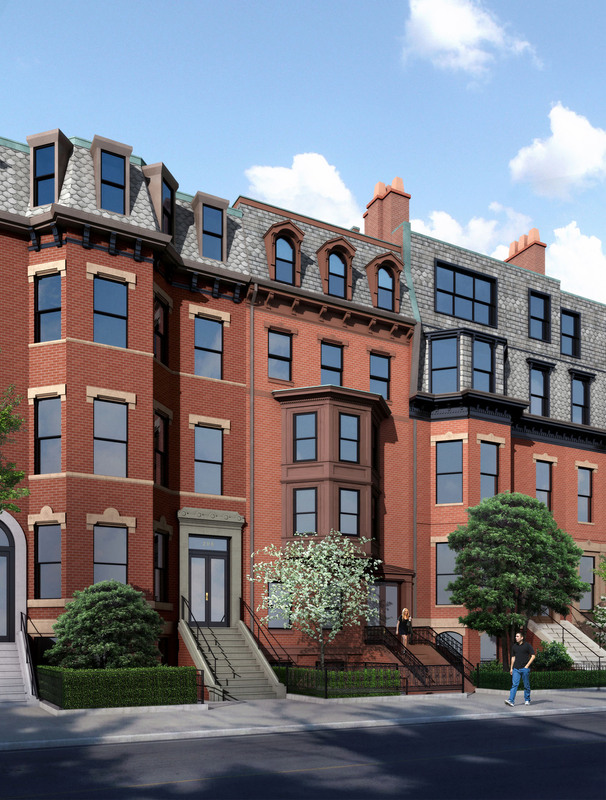 296 Beacon was built in 2016-2017 by the Holland Construction Company for the Oliver Realty Limited Partnership, a six-story, nine unit apartment building designed by architect Constantine L. Tsomides. The new building replaced an earlier apartment house, built in 1951, which, in turn, replaced the original townhouse, built ca. 1870 for Oliver Wendell Holmes. 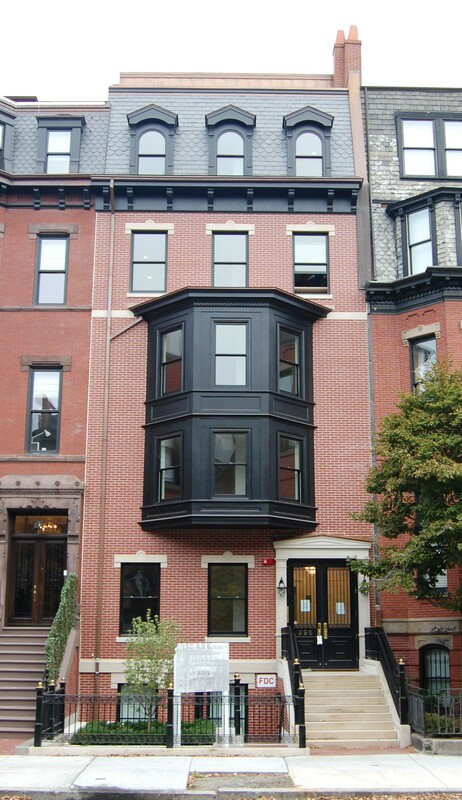 The new building was designed in a manner sympathetic to the design of the original townhouse and with the overall streetscape. Click here for an index to the deeds for 296 Beacon. On January 18, 2017, the Oliver Realty Limited Partnership transferred 296 Beacon to its affiliated entity, the O. W. H. LLC. The 1951 building was demolished in the fall of 2015 after having been damaged in a fire on March 26, 2014, which also seriously damaged 298 Beacon. Architectural rendering of 296 Beacon; courtesy of Constantine L. Tsomides, architect. The apartment house at 296 Beacon demolished in 2015 was designed by architects Herman L. Feer and William E. Nast, and built in 1951 as a seven unit apartment building for the Thomas & Eliot Investment Corporation (Thomas Spiro, president). 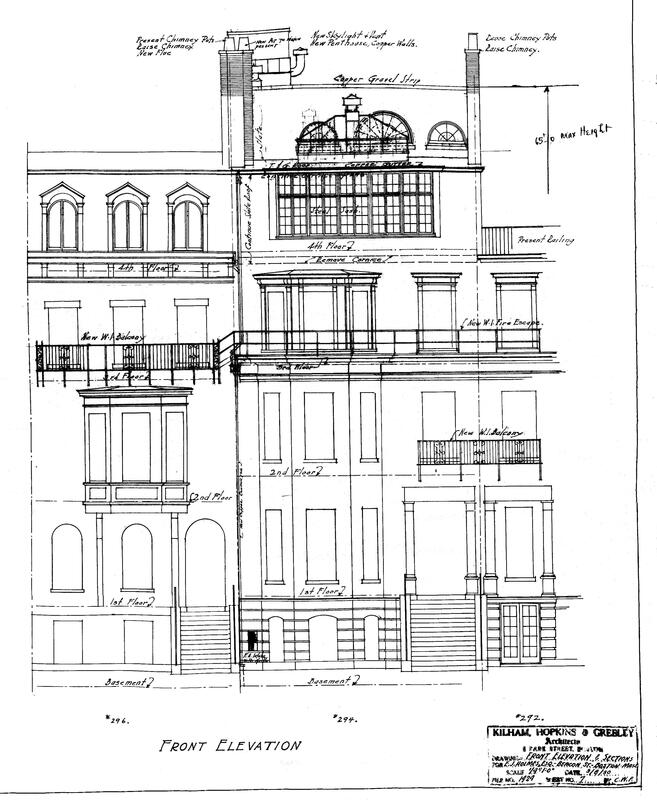 Architectural plans for the building — including front and rear elevations, floor plans, floor framing plans, and a plot plan — are included in the City of Boston Blueprints Collection in the Boston Public Library’s Arts Department (reference BIN R-124). On March 22, 1976, 296 Beacon was acquired from the Thomas & Eliot Investment Corporation by real estate dealer George P. Demeter. On February 1, 1996, he transferred the property to his affiliated company, the Oliver Realty Limited Partnership. It remained an apartment building. On March 26, 2014, 298 Beacon, the abutting building to the west, was seriously damaged by a fire caused by welding at 296 Beacon. 296 Beacon also was damaged by the fire. 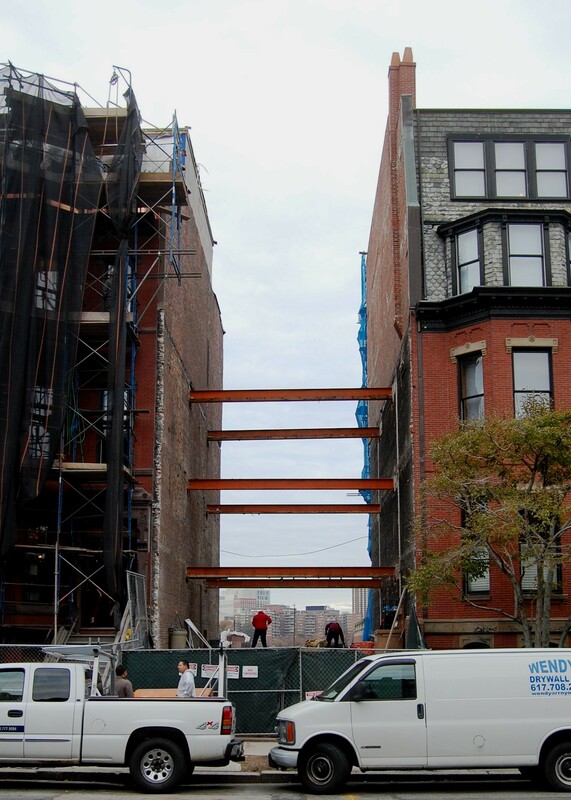 In October of 2014, the Oliver Realty LP filed for (and subsequently received) permission to demolish the existing building at 296 Beacon and replace it with a new six story building with nine apartments. Demolition of the building was completed in the fall of 2015. When it was built in 1951, 296 Beacon replaced an earlier townhouse at the same address. 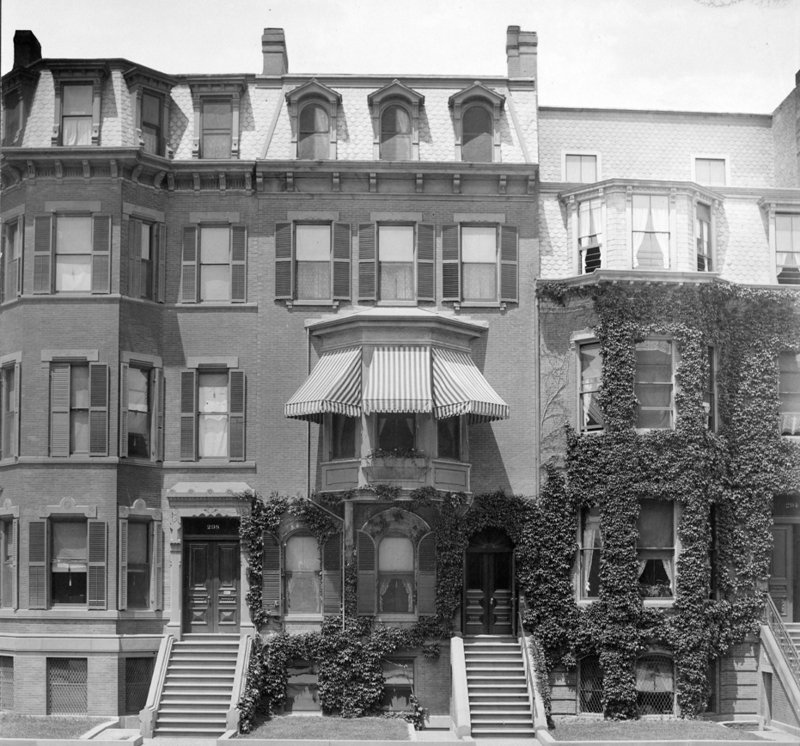 The original townhouse at 296 Beacon was built in 1870-1871 for Dr. Oliver Wendell Holmes and his wife, Amelia Lee (Jackson) Holmes. They previously had lived at 164 Charles. 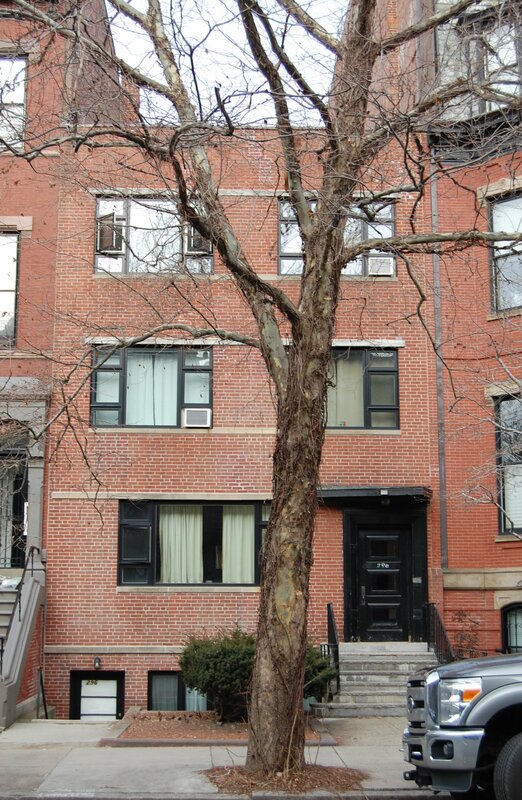 Amelia Lee Holmes purchased the land for 296 Beacon on October 11, 1870, from the Boston and Roxbury Mill Corporation. On June 23, 1871, after the house was built, she transferred the property to a trust established for her benefit under her father’s will, with her husband and her brother-in-law, John Torrey Morse (married to her sister, Lucy) as trustees. 296 Beacon was built with two entrances, probably one as the entrance to the residence and the other as the entrance to Dr. Holmes’s medical offices. Oliver Wendell Holmes was a physician and professor of anatomy and physiology at Harvard Medical School. He was a prolific and internationally recognized poet, essayist, dramatist, and novelist, best known for his Autocrat at the Breakfast Table. Oliver and Amelia Holmes’s three adult children lived with them: Oliver Wendell Holmes, Jr., Amelia Jackson Holmes, and Edward Jackson Holmes. Amelia Holmes married in May of 1871 to Turner Sargent (born John Turner Welles Sargent), a clergyman, and they moved to 59 Beacon. Edward Jackson Holmes married in October of 1871 to Henrietta Goddard Wigglesworth and they moved to 85 Marlborough. He was a lawyer and between 1869 and 1871 had served as private secretary to US Senator Charles Sumner. He died in July of 1884. Oliver Wendell Holmes, Jr., married in June of 1872 to Fannie Bowditch Dixwell and they moved to 10 Beacon. He was a lawyer and later would served as Chief Justice of the Massachusetts Supreme Judicial Court and then as a Justice of the US Supreme Court. 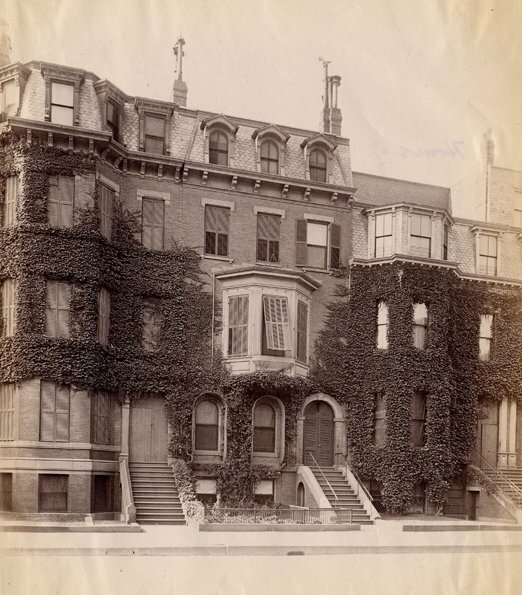 Amelia Sargent moved back to 296 Beacon during the 1887-1888 winter season; her husband, Turner Sargent, had died in February of 1877 and she had continued to live at 59 Beacon until she moved back with her parents. Amelia Lee Holmes died in February of 1888. She left 296 Beacon to her two surviving children, Oliver Wendell Holmes, Jr., and Amelia (Holmes) Sargent, with Amelia Sargent’s interest held in trust with Oliver Wendell Holmes, Sr., as trustee. Dr. Holmes continued to live at 296 Beacon. Amelia (Holmes) Sargent continued to live with him until her death in April of 1889. By the 1889-1890 winter season, Dr. Holmes had been joined at 296 Beacon by his son and daughter-in-law, Oliver Wendell Holmes, Jr., and Fannie Holmes. They previously had lived at 9 Chestnut. He had been appointed to the Massachusetts Supreme Judicial Court in December of 1882. Dr. Oliver Wendell Holmes died in October of 1894. Oliver Wendell Holmes, Jr., as successor trustee under his mother’s will, transferred his deceased sister’s one-half interest in 296 Beacon to a trust which his sister had established in her own will, with himself and his nephew, Edward Jackson Holmes, Jr., as trustees. He continued to own the other one-half interest in the property in his own name. Oliver and Fannie Holmes continued to live at 296 Beacon. In 1899, he was named Chief Justice of the Massachusetts Supreme Judicial Court, and in 1902 he was appointed to the US Supreme Court by President Theodore Roosevelt. After his appointment, they moved to Washington DC. By the 1903-1904 winter season, 296 Beacon had become the home of Edward Jackson Holmes, Jr., an attorney, and his wife, Mary Stacy (Beaman) Holmes. They previously had lived at 245 Beacon. They also maintained a home in Manchester. On August 7, 1909, he acquired 296 Beacon from his uncle and from the trust established under his aunt’s will. In July of 1930, Edward Holmes purchased 294 Beacon. In April of 1930, prior to taking title, he filed for (and subsequently received) permission to combine the two houses into one property, as a two-family dwelling with one family in each of the former separate houses. 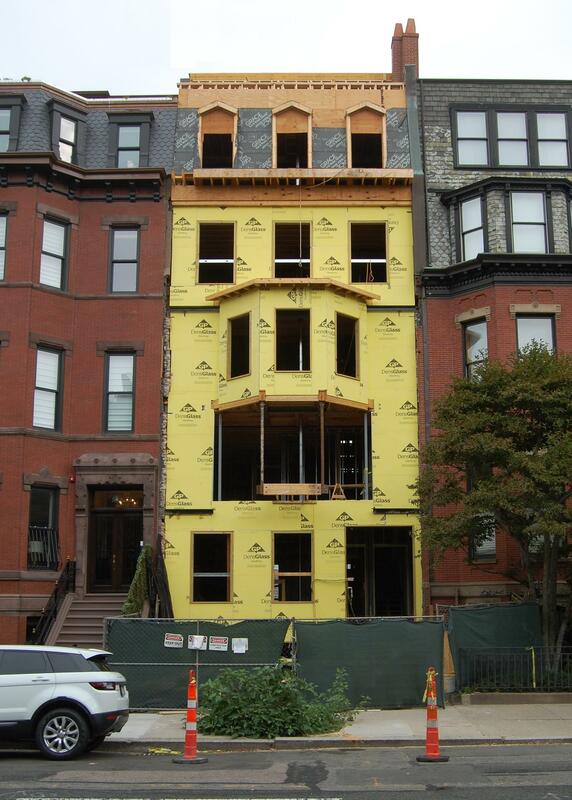 The remodeling was designed by architects Kilham, Hopkins, and Greeley. 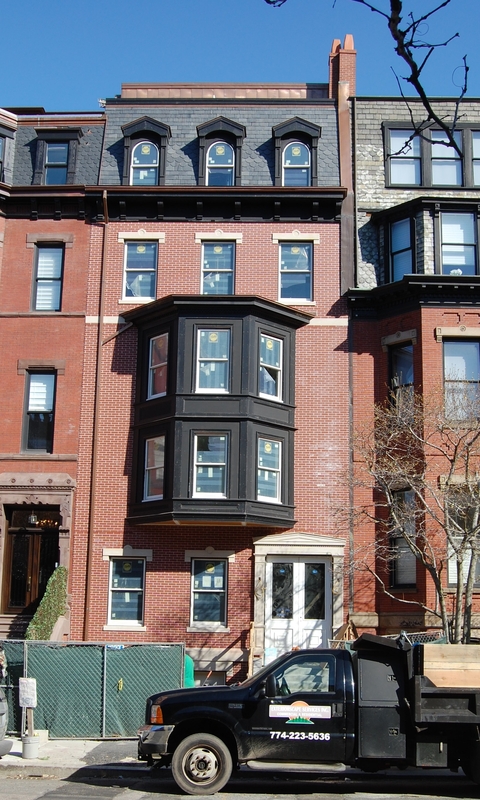 Edward and Mary Holmes lived at 296 Beacon and appear to have leased 294 Beacon to others. 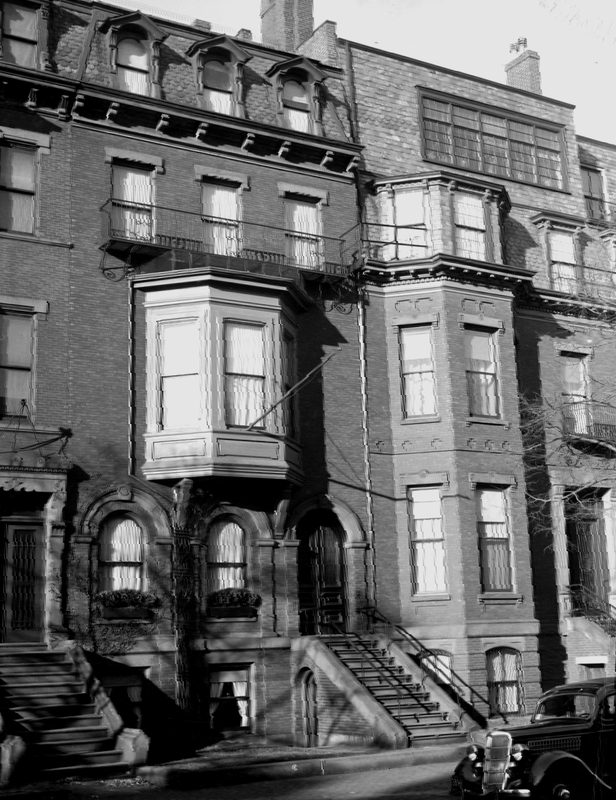 Edward and Mary Holmes continued to live at 296 Beacon until about 1941. In August of 1941, he filed for (and subsequently received) permission to separate 294 and 296 Beacon into two houses, with each remaining a single-family dwelling. 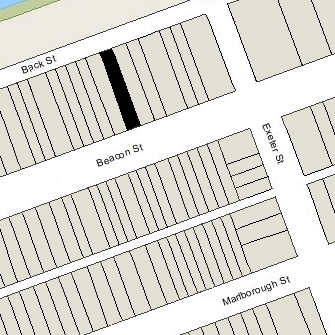 The decision to separate the houses appears to have coincided with the Holmeses’ decision to move from 296 Beacon, which was shown as vacant in the 1942-1946 City Directories. By 1945, the Holmeses were living in Topsfield. On August 18, 1945, 296 Beacon was purchased from Edward Holmes by Harold W. Pierce, an investment broker. It appears to have remained vacant.